Home / Dissent NewsWire / Silver Spring Justice Coalition Demands Answers After Unjustified Arrest of Neighborhood “Good Samaritan,” Samir Ahmed. Yes, He is Black. Silver Spring Justice Coalition Demands Answers After Unjustified Arrest of Neighborhood “Good Samaritan,” Samir Ahmed. Yes, He is Black. 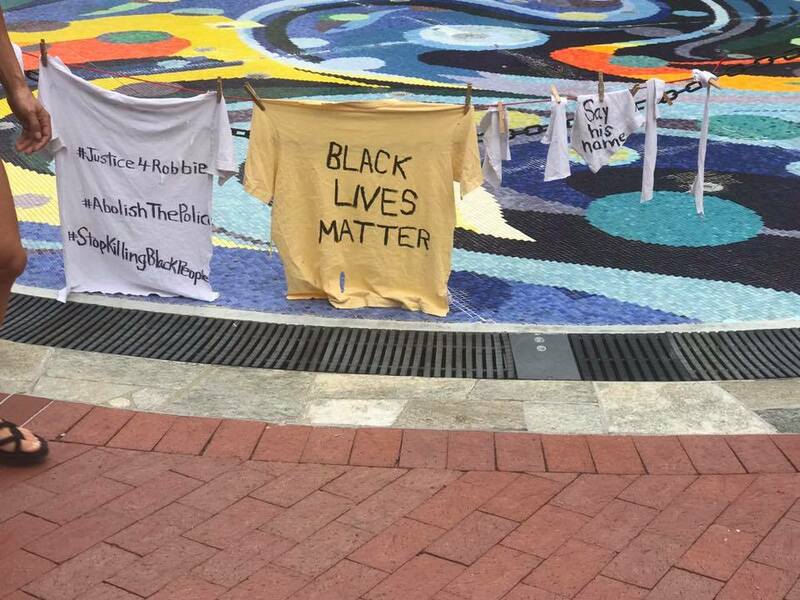 The Silver Spring Justice Coalition was born earlier this year to protest the unjustified killing of an unarmed Black man by a Montgomery County Police Officer. Residents of the city and county consider their community to be an oasis of progressivism and tolerance. The lack of accountability for the officer, or recognition that the police force acts the way police do everywhere and therefore serious reforms are needed, has compelled the Coalition to remain together to fight for necessary changes. Defending Rights & Dissent is a member of the coalition, which includes many grassroots organizations and individuals. In a community-driven process, the group is defining its mission and goals. All in the community are invited to participate (reach out to [email protected] to get involved). In November, police again disgraced themselves by treating another Black man with undue aggression, arresting Samir Ahmed in his own neighborhood after he had helped an intoxicated neighbor home. The video of Mr. Ahmed’s arrest went viral. The Silver Spring Justice Coalition has sent a letter to the County Executive, Police Chief, and the State’s Attorney for Montgomery County. The letter is below. We, the members of the Silver Spring Justice Coalition, are concerned about the recent arrest of Samir Ahmed on November 17, 2018. We request a meeting with County Executive Elrich and State’s Attorney McCarthy. According to numerous news reports, someone in the Silver Spring neighborhood called emergency services to check on the welfare of a resident who appeared intoxicated, however, when Montgomery County police officers arrived, they apprehended Mr. Ahmed, placed him in handcuffs, and held him, face down, over a squad car. Neighbors also asked, “what is he under arrest for?” to which one of your officers replied, “we don’t answer to you.” Your officer then said, “stop resisting” and neighbors can be heard saying “he’s not resisting.” Neighbors repeatedly asked officers to provide their names and the officers did not provide their names, other than the one officer who stopped to show her name on her uniform. It is unclear why Mr. Ahmed was arrested given neighbors quickly explained to police they had the wrong man, and that Mr. Ahmed was helping a neighbor who may have been intoxicated and incapacitated. In addition, a check of the local court dockets showed Mr. Ahmed has been charged with disorderly conduct, resisting arrest, failure to obey a lawful order and obstruction and hindering. Given the publicly available video of the arrest, members of the Silver Spring Justice coalition are concerned that these charges represent over-policing of minorities, and inability to admit error on the part of MCPD. The collateral consequences of these charges should not be taken lightly. Mr. Ahmed’s employment, ability to earn wages, and future employment prospects could be considerably impacted by these charges. Also, the taxpayers should not foot the bill for court costs, MCPD costs, and any public defense costs, for charges that should not have been filed. MCPD is not immune to racial bias in its police practices. This summer, Robert White, a black man with mental disability, was killed in an altercation with a police officer. The officer’s reason for initially stopping Mr. White, a rip in his shirt, does not dissuade the community that racial bias was not involved. During the listening sessions with Marc Elrich and Montgomery County residents, County Executive Elrich indicated more training was needed to address these two incidents. However, training without accountability is not sufficient. Further, any training model adopted by MCPD should include community input. We reject the police officer’s assertion that MCPD does not answer to the public. We, the citizens of Montgomery County, deserve a police force with officers who understand, that they do, indeed, answer to and serve the public, and a police force where we can trust the integrity in an officer’s decision to detain and arrest. We would appreciate a timely response to our concerns in this matter.